I’m Greek. My family loves olive oil and lemon… like REALLY loves it. My mom literally uses olive oil for everything (that’s another post in itself)! Growing up, we didn’t do barbeque with fancy rubs or sauces… this is how we did it…always! I promise, not only does this recipe taste delicious, but it is also really simple to prep and cook. This is our go-to meal when we have people over and we want to grill. Remember I’m from southern California, so the grill is something we use year around (not to rub it in or anything)! You could easily modify this and use an indoor grilling pan as well. In a bowl, mix chicken, olive oil, onions, garlic, salt, oregano, cumin, black pepper, wine and lemon juice. Marinate at least 2 hours (overnight is best). Soak wooden kabob sticks in water for about 20 mins (to prevent burning). Thread skewers with chicken, onions, tomatoes and bell peppers. Preheat outdoor grill or indoor grill pan to medium-high heat. Place kabobs on grill. Turn and baste occasionally with basting juice. Grill until chicken is cooked through. Serve immediately. We squeeze a little lemon on the chicken before eating (optional). 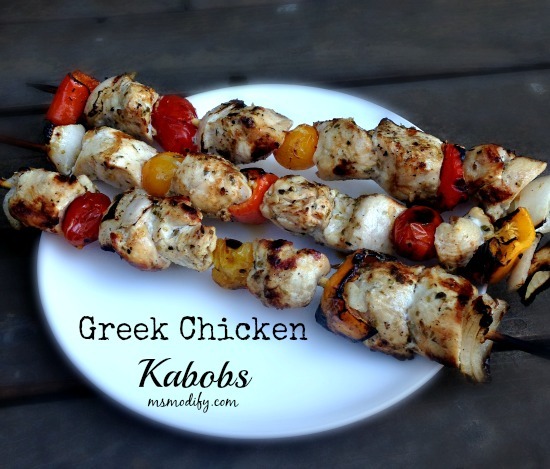 This entry was posted in Recipes/Dining Out and tagged barbeque, chicken, dinner, entree, Greek.